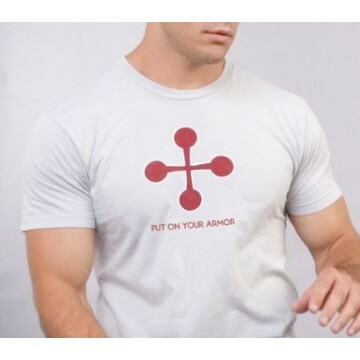 Silver Shirt with Maroon Symbol Symbol: Red Cross Pommele Symbol History: This symbol is taken from the shield of Michael the Archangel. The meaning of this symbol is lost, but it is a traditional symbol bearing a red cross pommele on a silver field. Sometimes the red cross is shown with trefoiled ends. Michael is known as the leader of all the angels in heaven. He is mentioned repeatedly in Daniel, and described as "the one who standeth for the children of thy people." Dn 12:1. In Apocalypse 12:7, it is stated "there was a great battle in heaven, and Michael and his angels fought with the dragon." 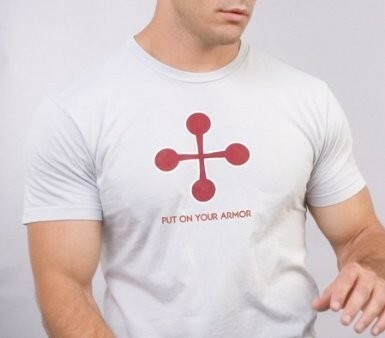 Scripture Passage: The phrase "Put on Your Armor" is taken from Romans 13:12: "The night is passed, and the day is at hand. Let us therefore cast off the works of darkness, and put on the armor of light."